Students are encouraged to apply as early as possible. Applications will be accepted after February 1 if space is available. For more information, contact Stacy Markman, FHL student coordinator. Students arrive Sunday, June 16 after 3:00 p.m., depart Friday, July 19 after lunch. Please note that you may be asked to move your belongings out of the dorms before breakfast on July 19 (to a building nearby) due to students arriving shortly after your departure. First meal for students is dinner served on Sunday, June 16 6:00-6:30 p.m.
Last meal for students is lunch served on Friday, July 19 12:15-12:45 p.m.
Students arrive Sunday, July 21 after 3:00 p.m., depart Friday, August 23 after lunch. Please note that you may be asked to move your belongings out of the dorms before breakfast on August 23 (to a building nearby) due to a group arriving shortly after your departure. First meal for students is dinner served on Sunday, July 21, 6:00-6:30 p.m.
Last meal for students is lunch served on Friday, August 23 12:15-12:45 p.m.
Each 5-week course in Summer A and Summer B will be 9 credits. Summer classes require a full-time commitment and are held Mon-Fri 8:30 am-5:00 pm, plus Saturday mornings 8 am-noon, except during the final week of classes when Friday is a half-day and there is no Saturday meeting. You may take courses sequentially, for example, one in each summer session, but not concurrently. 400-level courses are suitable for upper-level undergraduates or graduate students, 500-level courses are graduate-level. Well-qualified undergraduates may be admitted to a graduate-level course with the consent of the FHL Director and the faculty teaching the course. Students should confer with their advisor regarding transfer credits. Credits for FHL coursework will be earned through the University of Washington (UW), but you do not need to be matriculated at UW. 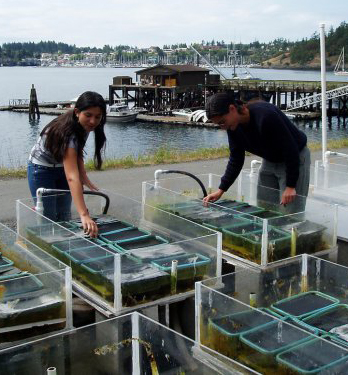 You must apply to and be accepted by Friday Harbor Labs before you can register for FHL courses. We will assist you in registering through UW Professional and Continuing Education (UWPCE). Students, including UW students, cannot register themselves for FHL summer courses without our assistance. Note: There are no FHL apprenticeships offered during Summer quarters. They are only offered during Spring and/or Autumn quarters. Interested in a Summer Research Internship or Independent Research?